I started my YouTube channel in November of 2016, posting craft tutorials, craft room tours, and sewing machine reviews. I’ve loved having a way to show you guys even more sides of my crafty life. Sometimes it’s easier to show you a tutorial in video format rather than in static images and text. Like many content creators, I support this blog with advertising. The advertising helps cover my server costs and costs of supplies. It does not cover all my costs, but that’s okay. This is my hobby, not a business (as much as I’d love for Craftcore to be a standalone business one day, I have a day job). I make a little money on my blog ads, and once I reached 10,000 views on my YouTube channel, I started generating a little revenue there as well . Unfortunately, that’s now changed. 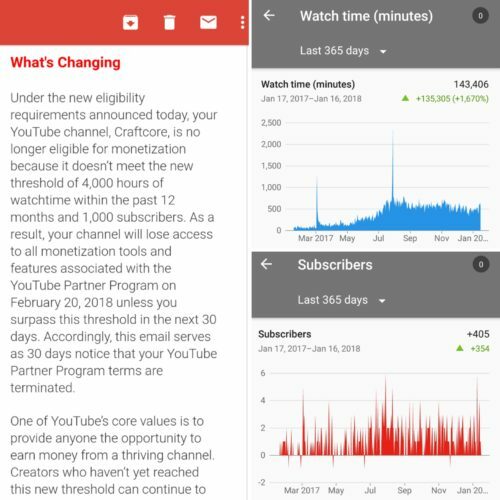 YouTube has changed their policy, and this change is affecting small startup channels all across YouTube. I know many small content creators like myself have recently reached the threshold, only to have the goal posts moved farther away. We have been given 30 days notice to reach the new threshold or face removal from the program. 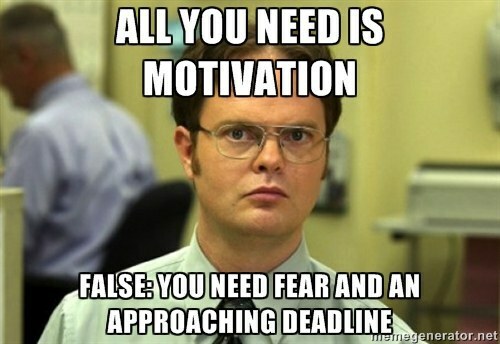 These goals are not going to be easy to hit. 4000 hours (240,000 minutes) of watch time and 1000 subscribers is a lot for us little guys. I’m currently about 60% of goal for watch time and 46% of goal for subscribers. As you are browsing the internet today, please consider stopping by your favourite small time channels. Please support them by watching a video, giving them a comment or a like, and subscribing to them if you want to see more. These small gestures add up and make a difference in the financial well-being for start-up channels. I’m disappointed that I most likely won’t reach the revised goal posts in 30 days. However, this is just reinvigorating me to shake up my current plans and put a stronger focus into doing what I do. Are you a YouTuber impacted by these changes? Let’s build each other up. 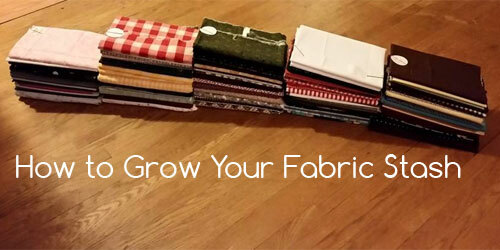 If you have a craft channel, consider joining a group where we can closely support each other. 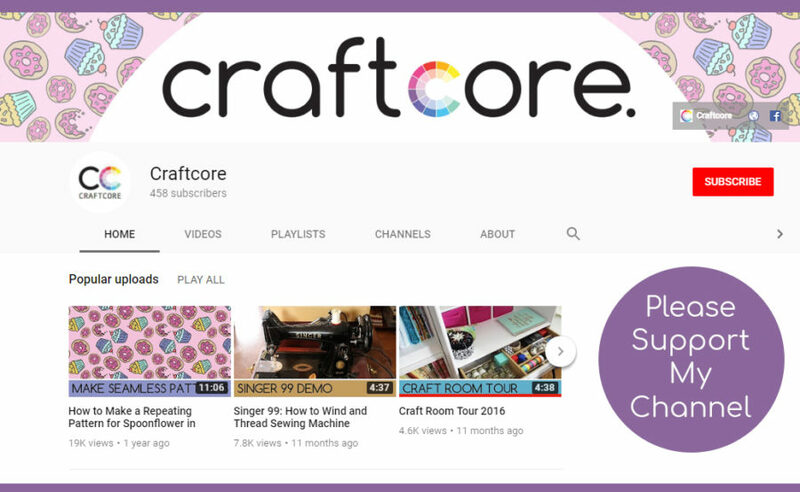 For example, the new group Crafter YouTube Channel Promotion on Facebook (I’m not affiliated in any way) looks like it will grow into a great community for our fellow crafters. If you haven’t already, please consider subscribing to this channel. I’m watching the #YouTubePartnerProgram hashtag on Twitter to see how the community reaction evolves. I’m hoping that YouTube will consider modifying this change, but as it stands, I’ll continue to upload videos on my YouTube channel as usual but with a slightly heavier heart considering that YouTube does show its support of small channels.